So we fell short of projected points on my top 3 picks, and did OK on my two flyers. Just a so-so week. Just proves you can’t kill it every week. The top-owned 7 'start every week' averaged 12.5 points, and include: SEA, PHI, ARI, NE, 49ers, DEN, and HOU. SEA as expected killed it and the Texans did better than I thought to skew the points high on the every week starters. So if you didn’t have any of those teams to start, and used one of the streamers, you did OK. Didn’t see the MIA carnage, and really didn’t see STL killing the Niners. On to this week. 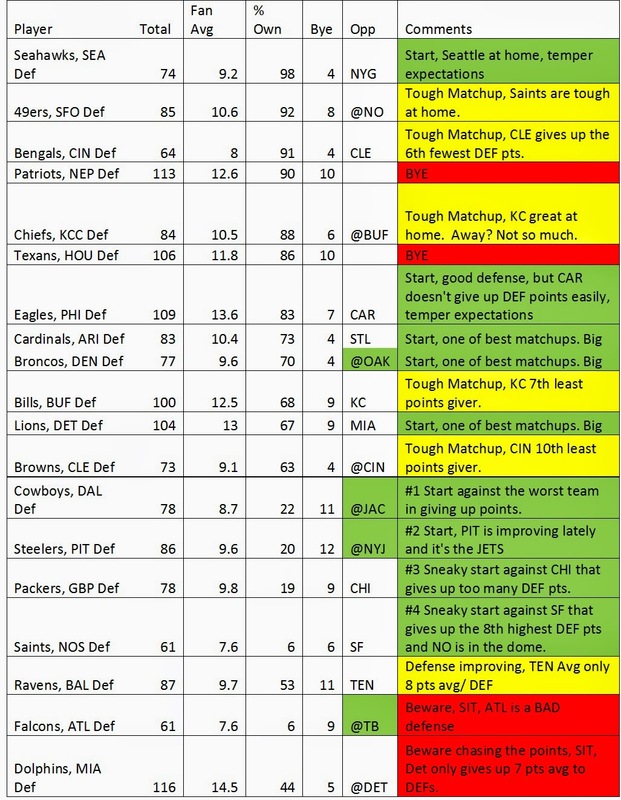 This week we’re facing another challenging week for defenses since 4 of the top 10 scoring defenses are on a bye week: Texans, Patriots, Colts, Vikings. Add to that, five of the top 10 % owned teams are facing tough matchups. Some statistical analysis confirms that my four targets to pick against are still ripe for the pickings. The Jags are giving up the most points to opposing defenses, TB is 3rd, Jets are 4th and Raiders are 11th. So it begs the question, who is 2nd? Welcome to my target list, Rams, you now give up the 2nd most fantasy points to defenses. But that won’t do you much good this week because they’re playing the Cardinals who are 70% owned…sigh. But if you happen to have a high waiver pick and they’re available, by all means pick up ARI, one of the best matchups of the week. Dallas is at Jacksonville, our number one points giver…uh oh. But the Dallas DEF hasn’t really been that stellar, plus they are on the road. But the road has been better for their defense than at home. On the road average 11 points, at home only 5! So take the 11 points, add some points for the lowly Jags and you get a projected 14 points for a team only owned in 22% of leagues. Steelers are matched up against another good target, at the Jets. The Steelers held a good BAL team in check and had a pretty good week for points. Feel confident that the Steelers will continue to kill it and expect another 12 points. So that leaves us with a couple of matchups on non-targeted teams. First up, the Packers DEF against CHI. Last meeting, GB only got 7 pts, but they were in CHI. The Packers are a good start at home and CHI is reeling right now, along with inter-player turmoil. Expect a decent showing by GB to the tune of 12 pts. Finally, what is going on in SF? The Rams racked up 18 points against them and DEN got 12 the previous week. At this point they’re looking vulnerable. They’re playing at NO and the Saints have been putting up good points against high offense teams the last three weeks. Give them a go if you have no other options, but expect a modest return of 10 pts. Atlanta is at TB, one of our target teams, but I REALLY don’t like the Falcons DEF. Outside of the week 3 thrashing of TB, they are averaging just over 4 points…yuck. Don’t be fooled, they are not a candidate this week. And how ‘bout dem Dolphins? I’m seeing a lot of noise on other sites that they are a top pickup for DEF this week but I’m thinking that’s because some are ‘chasing the points’. There’s no doubt that MIA can now be considered a top DEF, averaging 14.5 pts/game. But a bulk of their points have come against some top DEF point givers, like: JAC, CHI, and OAK. I think they play some good defense against DET this week, but not what they’ve been doing lately. I wouldn’t expect more than 10 pts. So there you have it for this week. If you don’t have a top-ten DEF to start or if you’re filling in a bye week, go with the following in order: DAL, PIT, GB and NO. ive used this every week and got a sneaky win with the vikings two weeks ago with the over time TD they werent even on my radar. So i have new orleans this week is that better than the eagles?